All of these devices supposedly run on 433Mhz so I should be able to listen in and hopefully decode them and put some sort of web interface and logging system on the pi to work with this. Links to the devices I bought at the end of this post. Now I have been reading through many many different sites and come across a lot of people sending (from arduinos) and receiving (to Pi). The majority of posts are dealing with sending of 433Mhz signals to existing devices, but there are very few people sniffing for existing devices. References at the end as well. The closest post I have found for receiving on the pi is this. Now instead of wiring directly into the pi I have placed a voltage divider on the GPIO input to protect the input on the pi. I compiled wiringPi and RFSniffer as in that blog post but get nothing out. I suspect it is because I am not using the associated transmitter. I am just sniffing the air for anything from the existing devices I have. So I tweaked some python code I found (thanks Alex) to just watch this pin and see what was happening. The code waits for a GPIO event and then prints to the screen. To confirm there was nothing wrong with this port I tested it with a floating high 3.3V signal and it was fine. First thing I can see is how can you have multiple “falling” detections in a row? Is the python script not fast enough to detect? So it looks like a bunch of noise at the moment and I am not sure where to go from here. RF Sniffer displayed a unique number for each. I saw nothing from the weather station or power monitor but I suspect that is due to a range or modulation issue. The range for the ones that did work is no greater than 5 meters even with an antenna attached. I received my 1M resistors today as well and made the plug to plug into my soundcard input and listened to the data pin with audacity. Damn there is constant noise on the data line which would explain why that Python script was constantly triggering. It would be near impossible to isolate anything signal on that. Maybe the BitPirate might give better results. You can see there is something happening every 5 seconds or so and that could be my weather station or power monitor but alas RFSniffer ignores it. and have ordered one of these which will hopefully increase the range to something useful like 30m through a few walls. The weather station is on the roof of a two story house. Is it possible that the signal modulation is different between the two receivers I bought? Is possible the weather station and power meter use some other form of modulation at 433MHz? The current range on the ones I have now are too poor for anything useful. I have soldered a 27cm antenna and coiled it 17 times so that shouldn't be the issue. Getting closer to my goal but any advice would be appreciated. Last edited by phoenixdigital on Fri Jan 16, 2015 10:52 am, edited 1 time in total. My pigpio library is likely to give the most reliable results. If the signal can be detected by piscope you can write code to receive/send the code. Basically, do it in the "brute force way" with a Pi is going to be a bad idea, since you'll use all your pi power just to sniff air. In my case (i was trying to decode signals from outdoor sensors of a weather station), i gave up since my pi has to do much more things than that. joan wrote: My pigpio library is likely to give the most reliable results. Thanks for the tip looks like a great little app. Could come in handy when the new receiver arrives. Will definitely run it on the pi and view on my fedora laptop which appears to be possible based on the youtube demo of yours. Couldn't find the other project you were referring to. Hmmm yes I think you are right there RFSniffer (compiled c) appears to chew up all the CPU (95%). Not ideal at all. Maybe I should look at incorporating an Arduino for sniffing. I was trying to avoid another tech and wanted an all Pi solution. Will see how the other tuner goes and then maybe look at linking it with an Arduino or is there something better suited for 433? I'm not convinced wireless static is an insurmountable problem on the Pi. I'm not sure how hard people have tried to filter out static in software. The pigpio VirtualWire is a Python implementation but is still comparable to (possibly better than) RFSniffer. A C version could handle filtering more easily. phoenixdigital wrote: maybe look at linking it with an Arduino or is there something better suited for 433? I was looking for a moteino, that basically is "linking it with an arduino"
For sure you would do it better but basically "filter out static in software" i think equals "search for a known pattern", so giving some calculation to every level change. Can't think about changing my script much..
btw, as we were saying in the other topic, even tour TX/RX class is consuming lot of cpu, so that's not far from "cpu intensive"
A C version could handle filtering more easily. That's quite sure. But i don't think in the "5%" class..
pattagghiu wrote: I was looking for a moteino, that basically is "linking it with an arduino"
It appears that all the heavy lifting is handled by these transceivers and this might handle most of the gruntwork. This can then leave the Pi to other duties and it can just check for new data every second or so. If my limited understanding of how these work is right. The only other issue is if I am sniffing two different devices which use different styles of transmission I might need two receivers? pattagghiu wrote: It appears that all the heavy lifting is handled by these transceivers and this might handle most of the gruntwork. This can then leave the Pi to other duties and it can just check for new data every second or so. If my limited understanding of how these work is right. On the Joan's vw.py, what adaptations should be done ? I found this great code today but I don't know how to adapt it. I noticed that I have to change "Specify Pi, rx gip and baud". My receiver data pin is connected to the pin 12 and power to the 17. I'm keeping the BPS at 2000. I am using Raspberry Pi B+ running Raspbian. There are 2 basic types of receivers; super-regenerative and super-heterodyne. The first sort is like the first type you posted. They are very cheap but also tend to have poor range. The superhet types have better range and are more stable. They are not significantly more expensive. Search for RXB6 for typical units. No signal noise output is common to most types and is a consequence of the gain being turned up to the max by the agc when no real signal is present. The noise pulses tend to be significantly shorter in width than real transmitted signals so a simple software filter that ignores these can help a lot in reducing cpu load on the Pi. This is particularly the case if using pigpio as the underlying bit handling mechanism. For example, most 433MHz protocols use data pulses in the range 500 - 2000 uSec. Ignoring pulses below 150uSec in width will dramatically reduce unnecessary handling of noise. I have 433MHz listeners using about 1.5% cpu background load (Pi3) and they run fine on Pi Zero. Look at my project for decoding temperature sensor signals with RF receivers. This may well be the forum I'm seeking. I inherited it with the house purchase. I do not have the reciever all you see is all i got. Is it possible to build a reciever with the Pi to pick up the signals from my mast. It is common to use 433MHz to transmit data from stations like this, but no guarantees. Establishing the frequency of transmission is just the first step. You then have to work out how data is sent and what its content is. If it is 433MHz then a simple 433MHz receiver (preferably superhet) can be used with a Pi to capture the raw data. The control electronics for the station are probably in the rectangular box half way on the mast. If you can get inside this and establish the make / model of the unit that might help identify what type of messaging is being used. 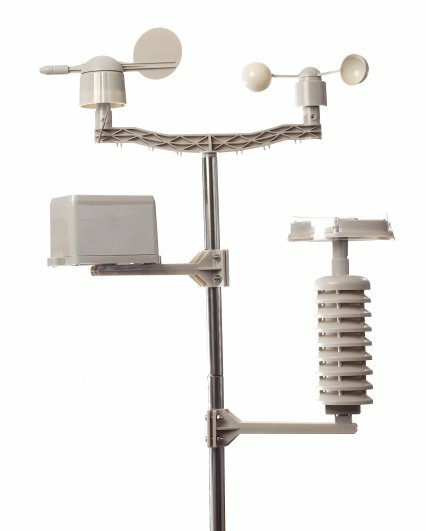 If you don't want to risk taking one of the components of the weather station apart to identify it (and a google search for WS images doesn't help, which it may), try posting the picture in an appropriate subforum on http://www.wxforum.net/. One of the experts there will almost certainly be able to identify it and may be able to give you more information about it. Maybe someone has already built a receiver for this one ? Here is what was under the tall round cover. 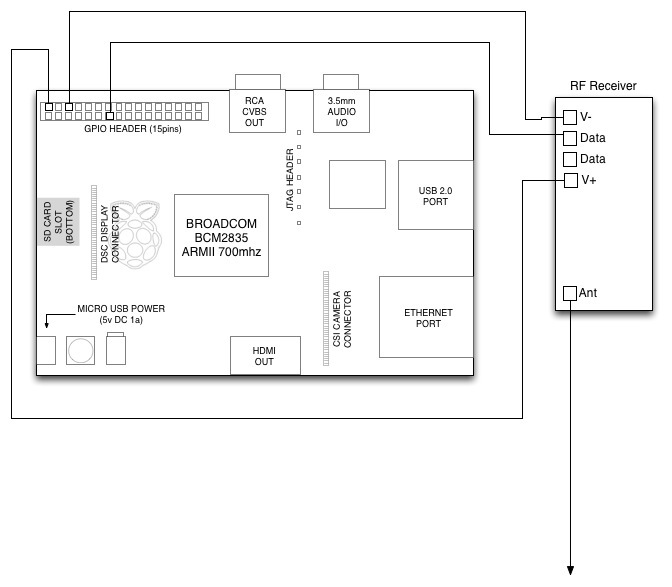 its been a few years since I was here but iirc i had better results with the V1 lib..
a cheap arduino sat with the RF receiver connected to your pi over a serial connection might be the simplest solution. For other basic fixed code encoding protocols such as PT2260, PT2262, PT2264, EV1527, etc. used for simple alarms,button controllers, etc. I use a sonoff rf bridge flashed with tasmota firmware, this £8 device sits and echos all RF signals it can decode as Mqtt topic/payload messages, which makes it a simple task to integrate any compatible device into your automation system. I've also put the picture of one of the transmissions as an attachment to this post. My guess is that this device uses a completely different kind of sync signal as the remotes. Also the pulse length seems to vary between a 0 and a 1 transmission. I already tried different protocol settings, but nothing worked so far. Are the current libraries able to handle such a signal? And if not, is there maybe a fork of those libraries that can handle this signal? The message is repeated twice in your sequence and is consistent each time. The following pulses are either 760uSec, 1420 uSec, or 2760uSec. There can be some timing distortion reading pulses so lets call these 700uSec, 1400 sec and 2800uSec as they are likely to be related to each other. You maybe able to find a library to handle this or is configurable in some way, but once you know the structure it is pretty easy to roll your own anyway. Your next hurdle is how to interpret the meaning of the data. As it s a smoke detector the amount of data is likely to be small so I would guess that most of this is made up of an address or id identifying the unit with then a small portion Indicating the state of the alarm. Thanks for the quick help. I also continued trying to get the rc-switch library to work for me. I simply copied the cpp and h file to my project and renamed the class so I can try different changes. The first thing I found out is that the nSeparationLimit of 4300 is to low for this signal. With the setting this low the receiveProtocol method is never executed on this signal. When I set this to 10'000 the receiveProtocol method is executed and tries to decode the signal. With this setting I did receive a consistent number from the library. The only strange thing is that the number is negative, but I will try some more settings to try to get this right. I think this works already very good with those changes. 1963815 is the decimal equivalent of 0x1DF727 which is what I though t the message was. I am not familiar with how that config works but I guess it is definitions are base clock period and then how header 0 and 1 are made up. So 1,2 (700/1400 for a zero and 700/2800 for a 1 makes sense. If you have more than one detector or can trigger an alarm then changes to the message received will help interpret what the bits mean. It is normally better to use hex for this as the changes are probably mapped onto particular bits. And the boolean at the end is for inverted signals. I've already tested another smoke sensor that I paired with the "master" smoke sensor before and this sensor now sends the exact same signal as the master sensor. So I don't really have to find out what the signal bits mean. I just have to listen for that one signal and send an e-mail or make an automated phone call. By the way, I also tried to run the same library and the python "rpi-rf" library on a Rasberry Pi 3, but receiving signals seams to be much worse compared to the Arduino. (Using the same receiver hardware) The rc-switch code only detects the signal about every 30 seconds instead of every second and the python library just detects all kinds of different values. I guess the Raspberry is just not made to analyze signals in realtime. Also both libraries utilize one complete cpu core while running. The Raspberry running raw python to do the low level timing detecting this type of real time signal will struggle to be reliable due to the nature of the OS which can switch to a different process in the middle of decoding. Also as you have noted if the timing is done in the foreground then it will burn up 1 core. However, it is possible to do reliable detection with low cpu utilisation on the Raspberry by using the excellent pigpio service to sample the raw data. As this uses dma to get the gpio data, it gets accurate timing plus it is then possible to do decoding of the pigpio data with low cpu utilisation. The pigpio site http://abyz.me.uk/rpi/pigpio/ contains some examples of decoding although they would need to be adapted for your protocol.